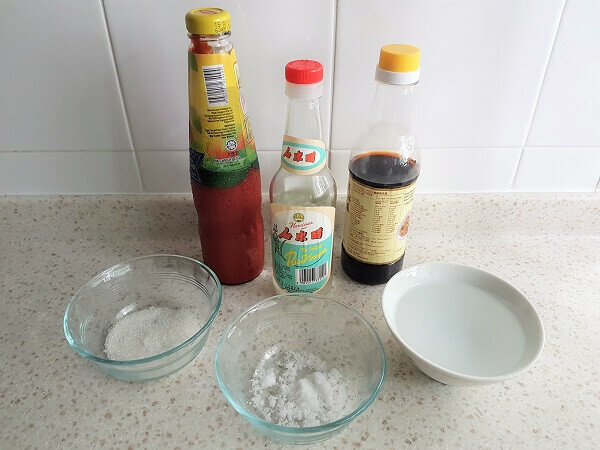 Sweet sour fish recipe – using a whole fish and simple everyday ingredients for the sweet and sour sauce. 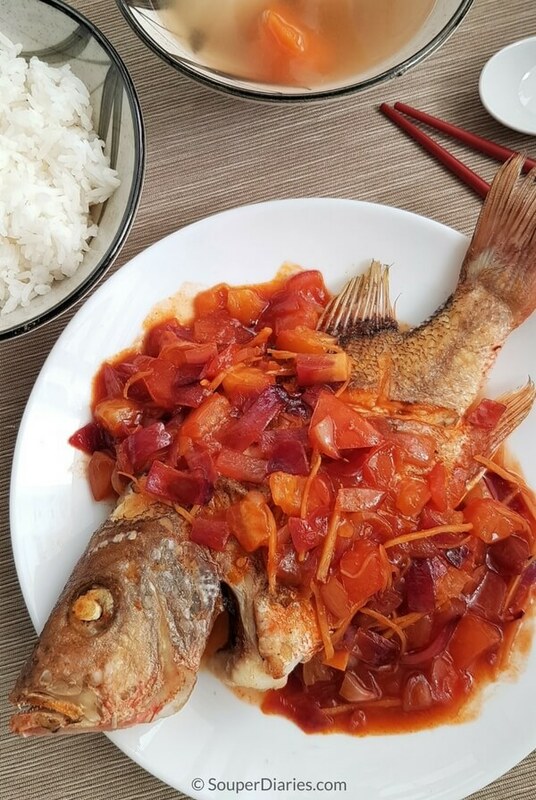 Sweet and sour fish is a popular dish for many and I’m one of them. I can’t resist the sourish, sweet and addictive sauce of this dish. I used to buy pre-made sauce in the past for convenience but no more. When you make a sauce from scratch, you have full control of the taste and you can easily customize it to your preference. I made the sauce from simple kitchen ingredients as I try to avoid complicated lists of ingredients. And the bonus is, there’s no wastage and no tossing away unused and expired bottled sauces. That’s it! These items are always available in my pantry so it’s really quick to prepare the sauce. If you don’t have rice vinegar, you may substitute with cider vinegar. Get all the ingredients ready before you start cooking for a smooth cooking process. Pat the fish dry to minimize any oil splatter when frying the fish. I did not deep fry the fish as it would require much more oil but you can certainly do that if you wish. Clean the fish. Then make 2 to 3 slits on each side of the fish. 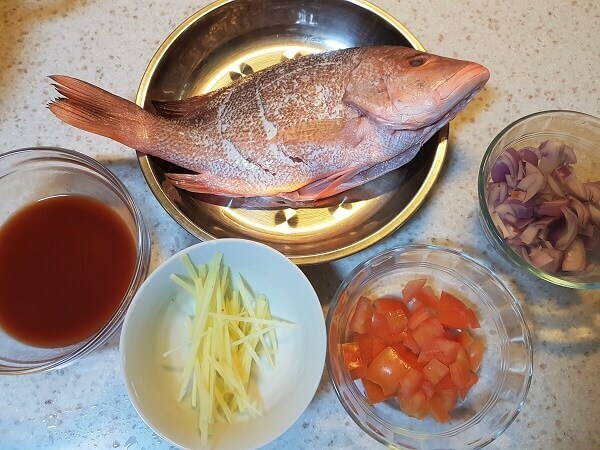 I used a red snapper for this sweet and sour fish recipe but you can also use other types of fish like garoupa, tilapia, black pomfret, seabass or any firm fleshed fish that you like. Rub some salt on both sides of the fish including the the insides of the slits. 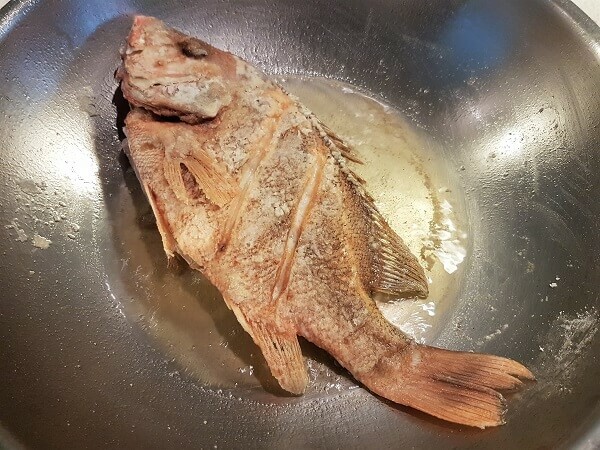 When ready to fry, dredge the fish with flour (corn flour or plain flour is fine). Heat oil in a wok till it is very hot. I prefer to use a stainless steel wok when frying fish as it gives a good sear. Carefully lower the fish onto the wok. Fry both sides till golden brown. 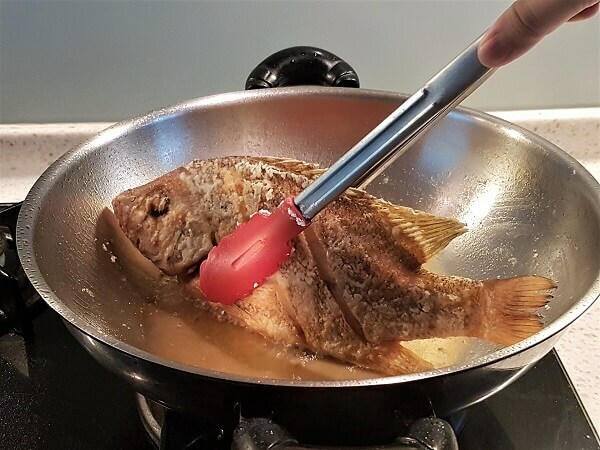 If you find the undersides not as brown as the rest of the fish, use a tong to grab hold of the fish and let it sit on the hot oil for awhile. Remove the fish and set aside when it is sufficiently browned. Pour away excess oil till about 2 tbsp of oil is left in the wok. Fry the onions and ginger till fragrant. I like my onions to have some bite so I just fry it for about a minute. Pour in the sauce mixture. 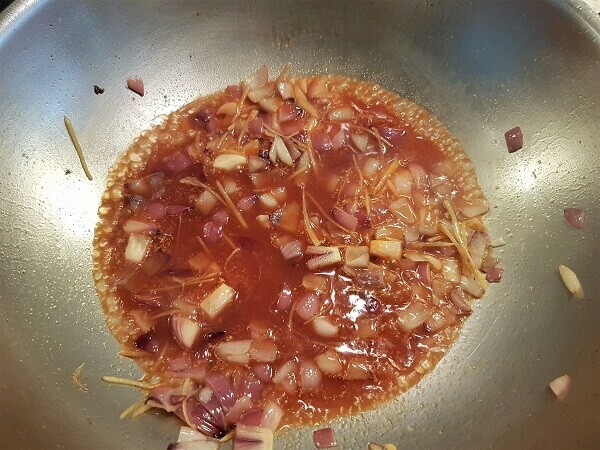 As soon as the sauce hits the wok you should see it bubbling as the wok is very hot. Stir fry for awhile till the tomatoes have softened to your liking. Pour the sauce over the fried fish and serve immediately. Serve the fish with some rice, a soup and some vegetables for a complete meal. Don’t want to miss a recipe? Sign up for Souper Diaries newsletter delivered to your inbox! Connect with me on Instagram, Pinterest, Twitter and Google+ for the latest updates. Thanks for reading and happy cooking! 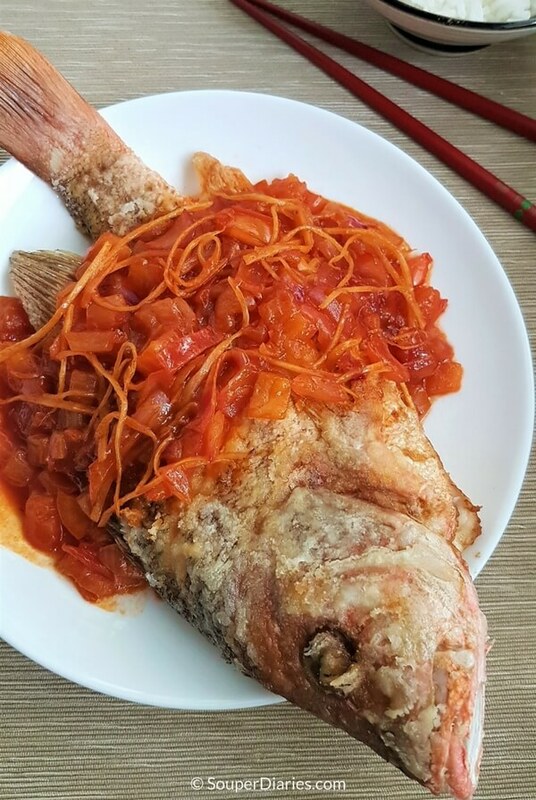 Fried whole fish topped with a delicious sweet and savory sauce. Gut and clean fish. Get a fishmonger to gut it for you to save time. Make slits on both sides of the fish. Rinse and pat dry. Rub salt all over the fish including the insides of the slits. Set aside. Mix all the sauce ingredients in a bowl. Set aside. When ready to fry the fish, coat with flour. Heat up oil in a wok till it's very hot. Carefully lower fish onto the wok. Fry each side for about 3½ minutes (or slightly longer depending on the thickness of the fish) on each side till golden brown. Remove and place on a serving plate. Pour away excess oil till about 2 tbsp is left in the wok. 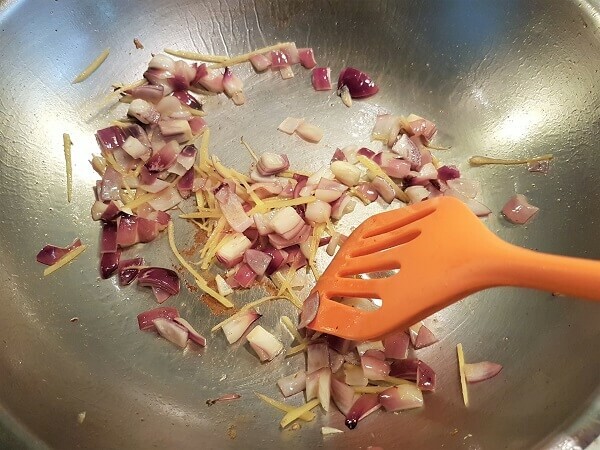 Fry the ginger and onions till fragrant. Pour in sauce. As soon as the sauce hits the wok you should see it bubbling. Now add the tomatoes and cook for about a minute till the tomatoes are softer. Do not cook for too long or the sauce will reduce considerably. Pour the sauce over the fried fish and serve immediately. That’s a pretty easy recipe! I will try it with a fish filet–can’t do the whole fish thing. You can cook sweet and sour fish with fish fillet too. Just as delicious! I do love to eat fish (mostly salmon and tilapia). I will try this easy recipe with tilapia as you mentioned and see how it turns out. I like the fact that only few ingredients are needed. Hu Yvonne, this looks great. 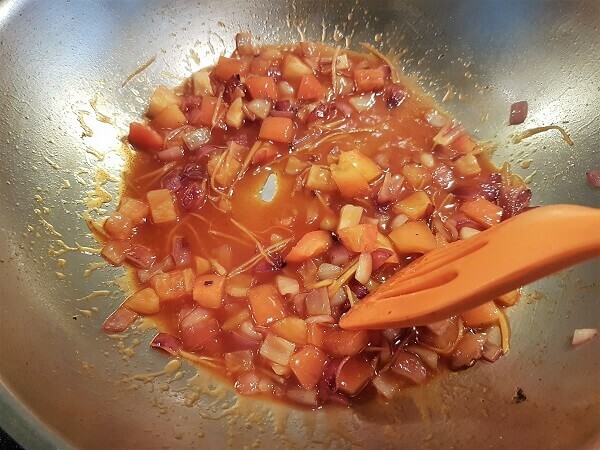 I love sweet and sour and have been making my own for many years, it is so easy once you have done in a few times. I have never tried it with fish, I usually have chicken or shrimps with sweet and sour, but I have a great fish counter in my local supermarket who often have whole fish on special, and I am going to try this out next time I can grab one. I also wonder if this would work with lemon sauce? What do you think? I love lemon sauce too!!! Great recipe. I have tried something similar with Talapia and it was real good.